What is causing the droughts that the Iberian Peninsula regularly endures? Why are the winters sometimes mild and rainy and other times cold and dry or cold and damp? Is climate change of anthropogenic origin exerting an influence on these processes? How are these cycles affecting the productivity of terrestrial ecosystems? And finally, can these cycles be predicted and the economy thus adjusted to them? The work, published this week in Nature Communications, was led by the University of Alcal de Henares. It was conducted in collaboration with the UPV/EHU, the University of Geneva and the University of Castilla-La Mancha and offers important keys for answering some of these questions. The North Atlantic Oscillation (NAO) is a large-scale fluctuation in the atmospheric mass located between the area of subtropical high pressures and the low polar pressure in the North Atlantic basin, and is largely responsible for the periods of drought on the European continent. Previous studies show that the NAO has a great potential effect on various aspects, from carbon fixing and tree growth to fruit production and forestry pest cycles. However, the connection between long-term forestry productivity and the NAO presented some inconsistencies, such as periods in which climate cycles did not correspond to what was expected in terms of the NAO value. In their work the researchers in fact show that these inconsistencies may be originated by periodical anomalies in the surface temperatures of the Atlantic Ocean, known as the Atlantic Multi-decadal Oscillation (AMO). They are ocean phenomena that appear in the North Atlantic and by which ocean temperatures follow a cycle that takes about 70 years in total. These temperature changes in the ocean affect the atmosphere not immediately but with some delay. The work in which Asier Herrero, the post-doctoral researcher in the UPV/EHU's FisioClimaCO2 research group, has participated in is the result of a painstaking line of research that was started over five years ago and which includes data from historical archives, climatology, statistical models and forestry ecology. "It has been a fascinating piece of work, dusting off archives of the end of the 19th century to get accurate estimates about how the productivity of forests across the Peninsula evolved over the last century and analyse them using 21st-century tools to understand the causes of the climate cycles and their consequences for the productivity of ecosystems," explained the researchers. 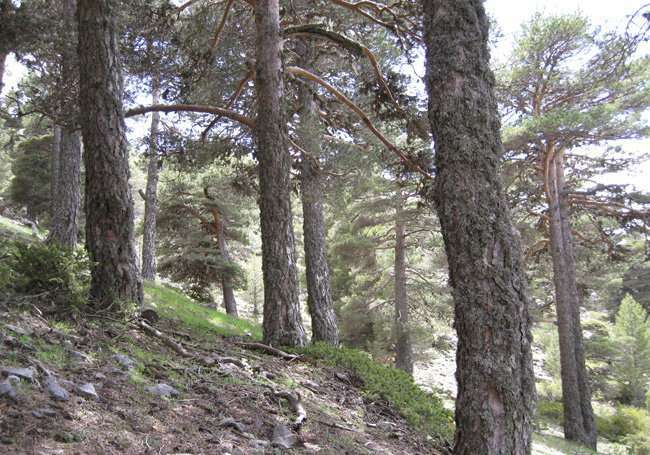 The research integrates data on pine forests in various localities in the Spanish regions of Castilla-La Mancha and in Castilla y Len. "These pine forests were the means of livelihood of many rural areas from the 19th century onwards, and that was why a detailed quantification of the available resources, timber, pastures, resin, etc. used to be carried out," he pointed out. The problem is that many of the previous pieces of work were based on projections of models and, furthermore, did not take into consideration the interaction between the two climate modes, the NAO and the AMO. Thanks to the existence of this time series, the study shows for the first time that it is the interaction of both climate modes which largely controls the productivity of ecosystems. So the results of the work show that the AMO+ NAO+ and AMO- NAO- phases exert a high degree of control on forestry productivity owing to the reduction in rainfall and wintertime temperatures. The NAO is like a key that opens up and closes off the entry of areas of low pressure. What is needed, however, is the control of the AMO (linked to the temperature of the Atlantic at extratropical latitudes and the formation of areas of low pressure), which eventually determines the temperature and humidity of the air that reaches the Peninsula. "The monitoring of the climate modes analysed may help to predict periods of severe drought, although it would not be an easy task, thus encouraging the applying of measures to adapt the forests more effectively," said Asier Herrero. During a drought, such as the one thrashing the Mediterranean in recent times, these findings could be crucial for water, agricultural and forestry planning, and in particular for assessing the climate vulnerability of the ecosystems.